Home / News / Best Newcomers! 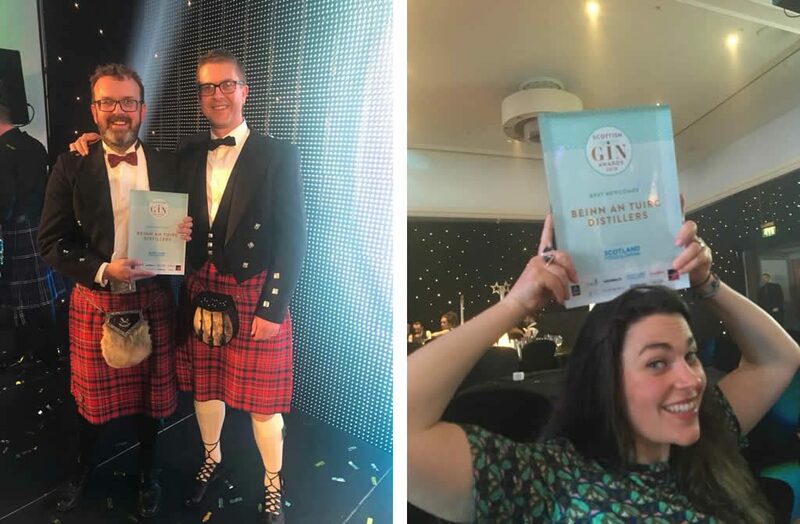 We were utterly delighted to be announced as the winners in the Best Newcomer Category at the Scottish Gin Awards in Glasgow last night. We were nominated in two categories – Best Newcomer and Excellence in Branding Award which was announced first. Sadly we missed out which was a bit of a blow as we have had such brilliant feedback since the start about our branding and Offshoot Design who came up with it have done a consistently brilliant job. That’s the way it goes sometimes though! Well done to the Electric Spirit Company who scooped the prize. A few announcements later and it was time for the Best Newcomer award. Tension mounted in the room – Niall and Kenny were at separate tables as guests of MCC Labels and Kimia respectively, whilst Emma stayed at home in Kintyre, glued to her phone (and re-runs of Green Wing if truth be told). 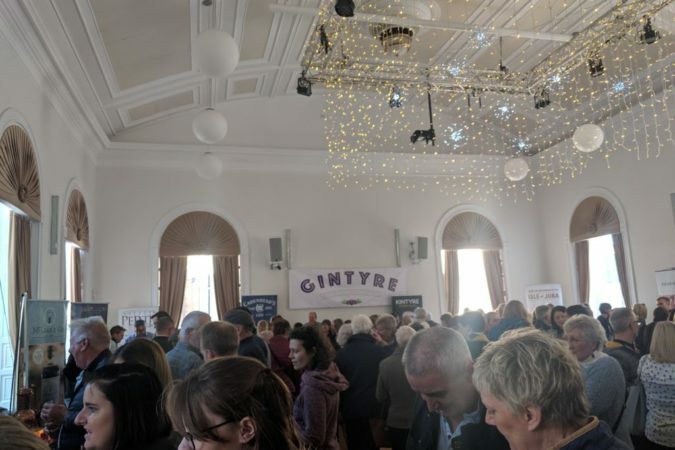 It was a busy category, with eight businesses altogether and it was clearly a very tough call as the first announcement was for a Highly Commended award. This went to Crafty Distillers who make Hills and Harbour Gin. With all still to play for, nerves were palpable but the trauma was over when compare Des Clark read out Beinn an Tuirc Distillers as the winner. Shrieks of joy ensued and the trio (Niall, Kenny and Emiliana, Kenny’s wife) trouped up to the stage to accept the award. 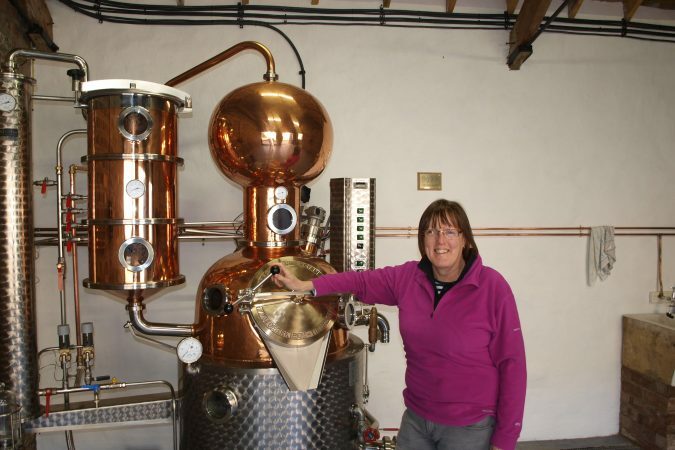 It was presented by Emma O’Brien who we met when she attended our Gintyre festival as Brand Ambassador for Harris Gin. She is now in a new role at Scotland Food and Drink and it was lovely to see a familiar face on the stage. After the photocall and the obligatory trophy-on-head shots it was time to sensibly call it a day and retire to bed for a good night’s sleep*. What a fabulous night. 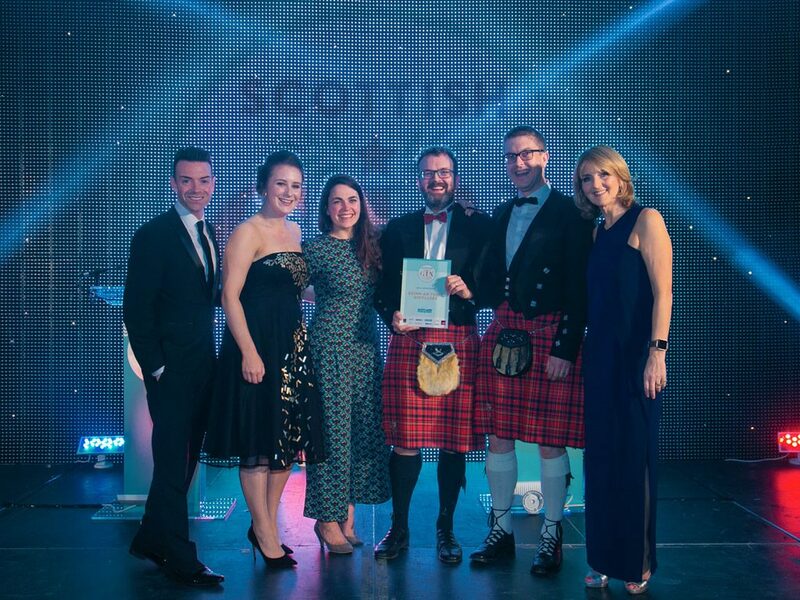 We are over the moon to be recognised as quality producers in the Scottish gin industry. It is a busy market but we are more than holding our own and hope to build on the success of our first year in business. *This did not happen. It was a room full of gin distillers and a 3am bar. Draw your own conclusions! 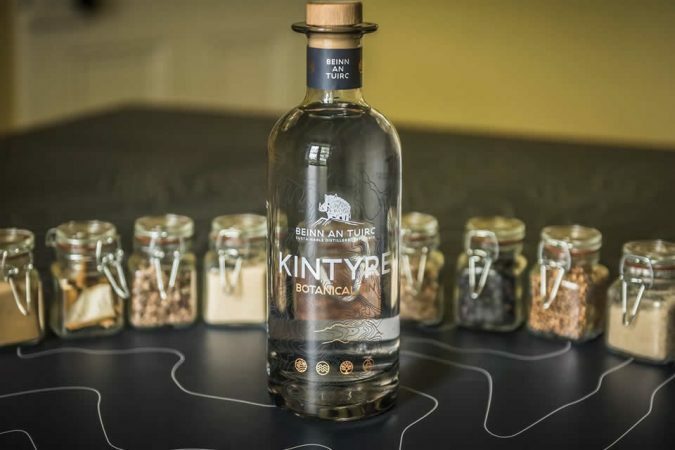 Tagged with: Crafty Distillers, Electric Drinks Company, KImia, MCC Labels, Scotland Food and Drink, Scottish Gin Awards.